It’s our main responsibility to keep everything secure on our computer as well as on mobile phones. Since in the last few years mobile phones are growing very fast in hands of people and people are using it more than the laptops and pc’s as it’s quite easy to get into what they are looking for. People keep their own photos, videos and other important documents as well on their mobiles and tablets in order to have a quick reach into, but this doesn’t mean no one will take a look at what you have on your mobile phone. There may be something very sensitive and private that you might not wish to be seen by any other. So you need to have a lock on it in order to keep it unavailable for them and be access-able only for you. From important files, I not only means images and videos but it includes anything you want to keep locked for any other. For example your messages, calls, applications, documents etc etc. How to Keep My Private Things Secure on My Mobile? Just like to keep secure any physical thing from unwanted damageable things or people, you use a lock or cover that works as a guard for your important things, same is the case with non-physical things (private files on your mobile or tablet) that you need to keep it out of reach of other unwanted people. Here you don’t need to buy a cover or lock to keep it secure, but need to install an app that enables you to do it within few clicks or swaps. The good news is that you don’t have to worry about what application is good for it because here in this post I am about to review and share a link to the best privacy guard app for your phone. Why To Use an App for it? For those who are saying why I should install an app in order to keep my files locked even I never give my personal phone to anyone including their family members. The fact is that sometimes they may get into your phone without your permission in your absence. Or the possibility is that you’re just ran out of your home in any emergency or you are in your shower and have left your mobile is in your room. Another possibility is that you are on a tour with your friends or colleagues and just left out your cell phone with your friend. So these are only a few possibilities in which the chances are very high and up that the other one may take a look at what you wanna keep out of reach of them. What I mean is never keep this fact ignored and install this small app on your mobile in order to have a big lock on anything on your mobile so you will be the only one to reach it out. What is The Best Locker Application for Your Mobile? Well, so you understood why and how intensely you need an application that works as a guard for your important files and documents that you want to be safe from anyone to reach it out. Don’t worry, we are here to review a great application having much more properties that you would just love to install and keep everything secure from anyone you want. 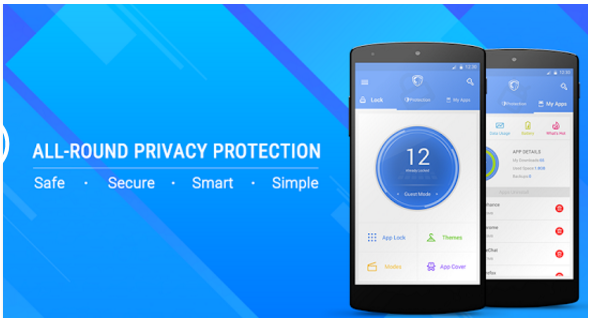 The app we are actually talking about is named as LEO Privacy Guard, this is a download link to the app from google play store so click on its name and you will find yourself on its google play store from where you will be able to directly install on your device. If you are an ios user then you might be wondering why this app is not available for us, but don’t worry about it you can also install on your device by CLICKING HERE. Similarly, this page would lead you toward an itunes page from where you will be able to install it on your apple device. Since there are tons of such applications that enables you doing so but why then you should install this one on you mobile phone. So to clear your mind, it would be great to discuss about the features that this application gives you. You will be satisfied of its amazing features and will realize yourself that why I was about to share this particular app with you for keeping your files secure. As we have shared the links for both major operating system’s. Keeping in mind that our readers are mostly using these two OS. Also someone may have two phones one with android os while other uses apple’s operating system and they might look for such an app that are installed on both of their devices. Yeah, It has the capability to lock almost everything that needs to be locked including call logs, messages, images, docs etc. By installing this app and using it, you will feel it yourself. It’s quite easy to lock your files while you’re in a hurry. This is not the end of what this app features but we’ve to mention the most important as a user perspective. I think you should now go to install this app on your device to keep yourself fully secure.